What we had feared has happened and the headlines have been running away with the story of "the first person to be diagnosed with Ebola within the United States has died...." and so on. This is the sad story of a 42-year-old man Thomas Eric Duncan who caught the virus while in his first home country of Liberia. This BBC page tells it all...of the rising hopes and expectations punctuated by hospital reports of his condition moving from serious to critical, and then like the case of our healthcare workers, the rising apprehension that our prayers could well have been in vain. We have another death on our hands. And then we have the matter of the health worker in Spain sparking off another headline about the first Ebola case to be diagnosed in Europe. Teresa Romero Ramos became a news item with..."the first person in the current outbreak to have caught the virus outside of west Africa" as reported on the web pages of the Guardian. "A Spanish nurse who was admitted to hospital in Madrid with the Ebola virus, after treating a repatriated patient who later died of the illness, had told health authorities at least three times that she had a fever before she was placed in quarantine. Teresa Romero Ramos is the first person in the current outbreak to have caught the virus outside of west Africa. Her first contact with health authorities was on 30 September when she complained of a slight fever and fatigue. Romero Ramos called a specialised service dedicated to occupational risk at the Carlos III hospital where she worked and had treated an Ebola patient, said Antonio Alemany from the regional government of Madrid. But as the nurse’s fever had not reached 38.6C, she was advised to visit her local clinic where she was reportedly prescribed paracetamol. Days later, according to El País newspaper, Romero Ramos called the hospital again to complain about her fever. No action was taken. "Duncan is believed to have become infected after he helped a pregnant woman with the disease into a taxi in Liberia that was to take her to a hospital. Hospital officials confirmed last week that Duncan had been sent home on Sept. 26 after an initial exam concluded he suffered from a "low-grade common viral disease." The hospital said that although a nurse, working from an Ebola checklist, determined that he had recently traveled from Liberia, that information was "not communicated to the full team." Days after Duncan was put in isolation, health officials said they were tracing as many as 100 people who had either direct or secondary contact with Duncan for monitoring. They subsequently narrowed the list to about 50, with only about 10 people said to have had close contact and be at the greatest risk for the disease — although health officials have repeatedly said the risk was low for all of the "contact traces." "The past week has been an enormous test of our health system, but for one family it has been far more personal. Today they lost a dear member of their family. They have our sincere condolences, and we are keeping them in our thoughts. The doctors, nurses and staff at Presbyterian provided excellent and compassionate care, but Ebola is a disease that attacks the body in many ways. We'll continue every effort to contain the spread of the virus and protect people from this threat." The two cases quite clearly buttress our belief that isolation, testing and immediate treatment is key to fighting the beast called Ebola and the delay in both the United States and Spanish hospitals to put immediate emergency measures in place shows either a dismal lack of knowledge of the how Ebola kills humans or a deliberate attack of amnesia as administrative and other silly, deadly ones at that, ramifications click into place. A very sad and tragic lesson for all those taking care of people with high fevers. We pray that health professionals all over the world will now advise themselves to eliminate Ebola as a first step when people present with a fever - especially if they are from areas where the beast rages. There is no excuse for this. We have just seen on the BBC website that the nurse who was taking care of the priests who died in Spain and who is now admitted in a hospital after she caught the disease has revealed that she may have touched her face with her gloves after cleaning out the room in which the priests passed on to the great beyond. This should be a lesson for us in Sierra Leone and could well explain why our brave health delivery workers keep succumbing to the ravages of the scourge, the beast known as Ebola. This means that we need more of the right protective suits, not just any suit that is described as protective by donors from various quarters. These protective suits have to be medically sound and must be able to protect the wearers. 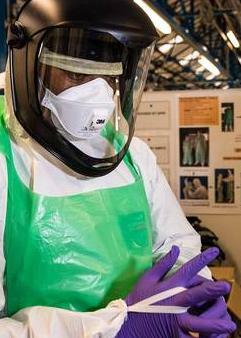 Next - we believe that we need quite a lot of these sound protective suits as it would seem that even though the health workers are protected, taking them off could well create an opportunity for infection - not only for the health care workers, but also for other patients they may want to touch. Therefore in our humble opinion, it will have to be one fresh suit per patient and no matter what the load, the next patient would have to be handled in a fresh suit to minimise the health risks. We ask for a close eye/supervision to be kept on health workers taking off their suits and making sure that they do not have any part of these suits touch any part of their body. Indeed as the man who first put the finger on Ebola Professor Piot warned that even the simplest movement, like rubbing your eyes, is a risk. "The smallest mistake can be fatal," he said. "For example, a very dangerous moment is when you come out of the isolation unit you take off your protective gear, you are full of sweat and so on." 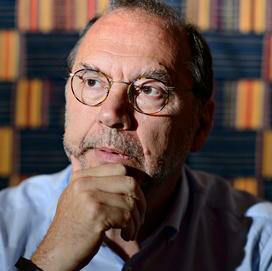 Professor Piot said he was not surprised by the case of the nurse in Madrid and expected more cases in Europe and the US, although he did not expect to see the illness spread as rapidly as it has in Africa. Many of those who have died of Ebola in West Africa have been health care workers." And we have just seen on Sky news that a company has been contracted to send a hundred thousand protective suits a month to Sierra Leone as the UK steps up the fight against Ebola with seven hundred and fifty troops, a whole battalion, sent in to help. We welcome this and the latest US effort not only for Liberia which appears to have the largest casualty figures but for Sierra Leone and indeed the sub-region. The new kit will be supplied by a company in Hull and this video should provide something that could help minimise infection through contamination. This report on the pages of the Hull Daily Mail says it all - "TWO Hull companies have teamed up to supply the British Government with vital safety equipment as aid workers fight the spread of Ebola in Sierra Leone. Arco is shipping 100,000 suits a month to the disease-hit country from its National Distribution Centre in west Hull. 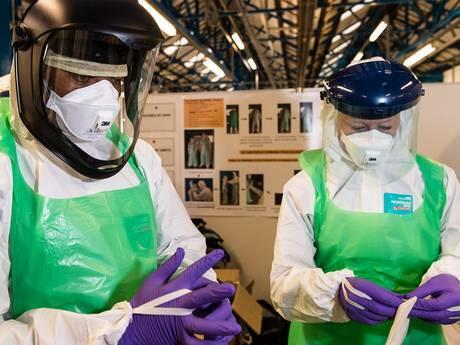 The gear, which has been requested by the Department for International Development in a seven-figure contract, will be used by 750 British troops and other workers on the ground to protect them from infection. It has been designed by fellow Hull firm Microgard. Ebola, which is spread when people come into contact with the bodily fluids of an infected person, has claimed the lives of thousands of people across western Africa this year. Thomas Martin, Arco joint managing director, said: “To get to this stage, it has taken the best part of six weeks - you might think it’s a long time, but I think it is pretty impressive. “They couldn’t have done it any faster and done a professional job. 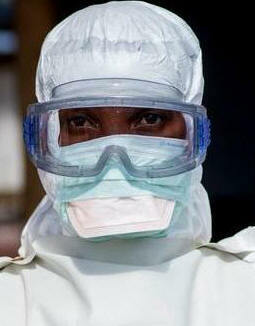 “This gear will be used whenever they are in an environment where there is an infected person.” The Government had initially ordered 50,000 suits a month but stepped up the scale of production as the size of the crisis became clear. The equipment, which feature a disposable sealed suit, gloves, a hood, visor and respirator will be driven down to RAF Kemble in Gloucestershire and flown to Sierra Leone in cargo planes. Initial shipments are coming from a stock pile in Hull, but after those have been exhausted, they will be shipped directly by Arco from a manufacturing site in China. The deal is set to last for five months and the first flight left on Monday." Meanwhile a row is developing in the UK on whether airport screening at all points of entry should be in place after the US ordered that should be the case at five entry airports that would take a closer scrutiny at passengers travelling from the areas worst hit - Sierra Leone, Liberia, Guinea and Nigeria and indeed the whole of West Africa as the UK has the largest number of people coming from the sub-region. The UK is reported to have been following World Health Organisation guidelines that proper screening be done at the point of embarkation. Given the level of corruption in all things possible in Sierra Leone, we would urge that the medical team, the troop deployment medical corps, should have one such set up at the Lungi international airport and that their screening ports be manned by them. This would greatly reduce the risk. The Daily Mail has been asking questions. In the meantime, the Royal Navy medical contingent is preparing for its role in the fight against the treacherous and deadly scourge in Sierra Leone with the planned deployment of RFA Argus. "14 Merlin helicopters, Royal Marines and the Royal Navy’s ‘floating clinic’ RFA Argus will join the fight to stop the spread of the deadly Ebola virus in West Africa. Three Merlins from 820 Naval Air Squadron will join Argus and sail to Sierra Leone to support UK’s growing effort on land to deal with the outbreak of the disease. After a meeting of the Government’s COBR emergency committee, chaired by Prime Minister David Cameron , to discuss the worsening virus crisis in Africa, Defence Secretary Michael Fallon announced that the UK armed forces were ramping up their efforts. The helicopters and auxiliary ship will be used first and foremost to help medical efforts on land, where Britain’s Armed Forces are playing a pivotal role in tackling the crisis. “The inherent flexibility of the Merlin, the Navy’s latest Anti-Submarine helicopter, acting in a transport and utility role from afloat, will mean that medical operations ashore can be fully supported. “Our people are fully committed to this vital role.” Thanks to her impressive medical facilities, including wards for up to 100 patients, an operating theatre and intensive care/high dependency units, Argus also has the capacity to support medical efforts currently provided by UK personnel ashore in Sierra Leone. Mr Fallon said the Ebola outbreak posed “a global threat to public health” and was vital that the UK remains at the forefront of responding to the epidemic." We wish everyone involved in this battle against the beast snuffing out the lives of our people every success in the hope that soon...and very soon they would be on top of the situation. God bless them and their relations as we continue to advocate for more to be done for the survivors of the disease as well as the relations and dependents of those brave health workers who have died giving their all so that others may live. And we again ask - has the rat and his fellow vicious rodents absorbed these surviving brave health workers into the civil service as he promised? Have they worked out a pension plan for them instead of the corrupt pension cesspit NASSIT stealing money from the coffers of tax payers to put into the paws of the rat "as a contribution to the fight against Ebola"? We saw this and hope it will trigger more positive action on why we need to save as many of our brothers and sisters as possible. "Ebola’s initial symptoms include fever, headache, diarrhea, and vomiting — all of which sound misleadingly common and relatively treatable. But the disease can quickly progress, with mortality rates of upward of 70%. “At the end stage of the disease, you have small leaks in blood vessels,” Thomas Geisbert, an immunologist at the University of Texas Medical Branch at Galveston, told NPR in August. “You end up with essentially no blood pressure. Your body temperature drops and you go into shock.” That’s largely because Ebola can provoke a “cytokine storm” in the body, as the immune system launches an all-out response to fight off the disease — which simultaneously ravages a human body, damages blood vessels, and further lowers blood pressure to dangerous levels."